When we’re working with clients who have experienced trauma, targeting the limbic system can make our interventions more effective. But what exactly is limbic system therapy, and why is it so useful in treating trauma? In the video below, Bessel van der Kolk, MD answers these questions and explains why he uses this kind of approach with his patients. Take a look – it’s just under 5 minutes. 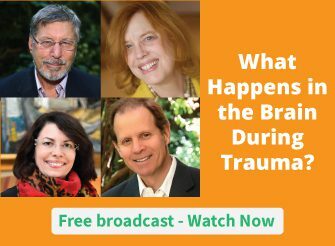 For more on how to work with the limbic system to reverse the physiological imprint of trauma, please check out the Treating Trauma Master Series. You’ll get insights from: Bessel van der Kolk, MD; Peter Levine, PhD; Pat Ogden, PhD; and Ruth Lanius, MD, PhD. Now we’d like to hear from you. How will you use this idea in your work? Please leave a comment below. It would be great if you had a less expensive version of the Treating Trauma Master Series for those who are fighting trauma themselves. I took of risk of learning to skateboard at age 39. Having been overprotected as a child, this was huge for me. Sports were off limits growing up. Skateboarding changed my experience of my body and what I was capable of, my self-perception and my life. I wrote my first of 20 books at the time I learned to skateboard. I was also getting Rolfed at that time. And I had started studying dance ( a dream from childhood that had yet to be fulfilled). It all added put to moving into totally new territory within and in my life and career. I had become an art therapist the year before all this happened. I have a client who needs this type of therapy. His trauma started when he was 3 and continued thru his teen years. He screams constantly and subsequently his teen son screams. My client has severe back problems so I’m not sure there is a type of martial arts that he can learn. His son has a trauma his dating back to birth. I see where this could be beneficial for the son, however not sure what therapy would be best for the father. Any suggestions?